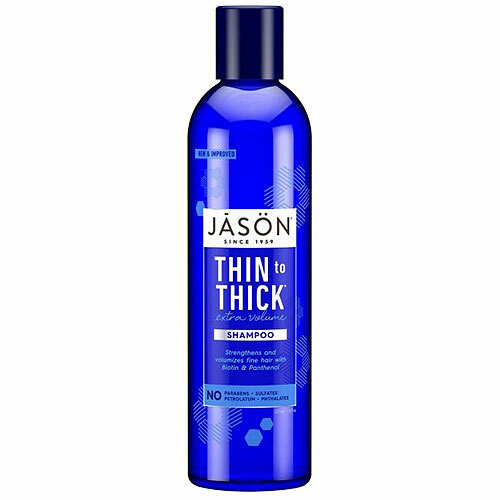 Jason`s rich lathering, bodybuilding shampoo uses gentle botanical surfactants to thoroughly purify the scalp and cleanse the hair of dirt and oil. Hair-strengthening biotin and panthenol wrap around the entire hair shaft to boost volume and increase hair cortex elasticity for less breakage. Natural plant proteins add luster and bounce. Your hair looks and feels naturally thicker, with a healthy shine. Aqua (Water), Aloe Barbadensis Leaf Juice*, Cocamidopropyl Hydroxysultaine, Sodium Cocoyl Isethionate, Glycerin, Sodium Laurylglucosides Hydroxypropylsulfonate, Mentha Arvenis Leaf Oil, Acer Saccharum (Sugar Maple) Extract, Ascophyllum Nodosum Extract, Chamomilla Recutita (Matricaria) Flower Extract, Chenopodium Quinoa Seed*, Citrus Aurantium Dulcis (Orange) Fruit Extract, Citrus Limon (Lemon) Fruit Extract, Equisetum Arvense Leaf Extract*, Saccharum Officinarum (Sugar Cane) Extract, Salvia Officinalis (Sage) Leaf Extract, Vaccinium Myrtillus Fruit Extract, Biotin, Alcohol*, Benzyl Acetate, Camphor, Citric Acid, Guar Hydroxypropyltrimonium Chloride, Lactic Acid, Lauryl Glucoside, Menthol, Panthenol, Phenethyl Alcohol, Phytantriol, Salicylic Acid, Sodium Chloride, Stearyl Citrate, Terpineol, Triethyl Citrate, Benzoic Acid, Benzyl Alcohol, Potassium Sorbate, Sodium Benzoate, Cinnamal, Cinnamyl Alcohol, Eugenol, Limonene, Linalool. 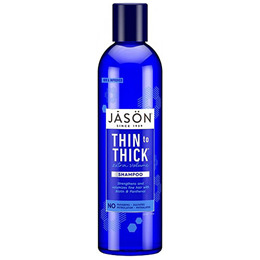 Below are reviews of Jason Thin to Thick Extra Volume Shampoo - 237ml by bodykind customers. If you have tried this product we'd love to hear what you think so please leave a review.